You know what that means, right?! Sunday – Fun Day! I decided to fun up my morning by making us some darling little doughnut bites. Because really, is there anything better than waking the person you love with the seductive smell of hot dough…? Really. Is there? If so, mama wants de-tails! Moving on! 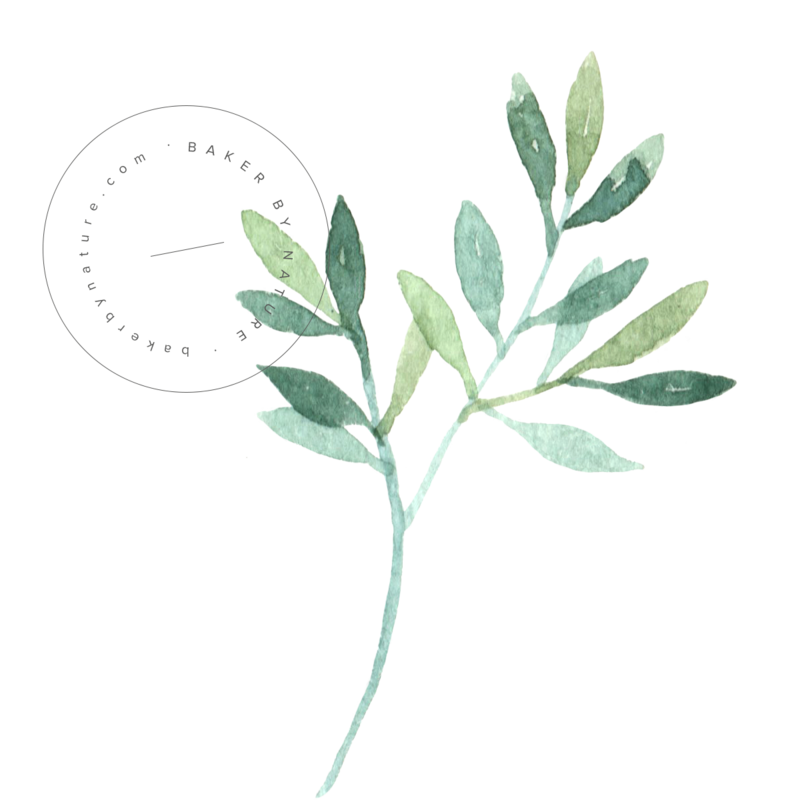 Let’s talk cooking methods. I went the baked route for these doughnut (bites) because frankly, I’m terrified of boiling oil. Terrified! Perhaps one day – when my kitchen is a little more generously spaced – I’ll overcome this haunting fear. But until then, it’s baked doughnut bites all the way home! Ready to talk dough flavor? Cool. In these bites things get exciting and classy with lemon zest and poppy seeds. Lemon – poppyseed is the LBD of flavor combinations. It’s classic. After rolling, but before baking, we give the doughnut dough balls a roll around in granulated sugar ensuring tons of crispy crunchiness. Crispy crunchiness is a doughnut bite essential for me. These doughnut bites are made for sharing! Spray a mini muffin tin with non-stick spray and set aside. Preheat oven to 350 degrees (F). 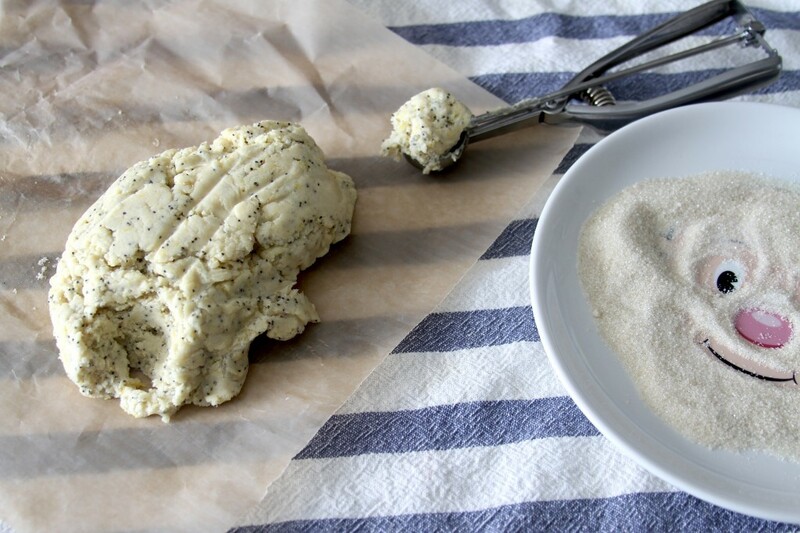 In a medium sized bowl, whisk together flour, baking powder, poppy seeds and salt. In a separate medium sized mixing bowl, whisk together, buttermilk, sugar, lemon zest, vanilla, and melted butter. Gently stir dry ingredients into the wet mixture and mix just until combined. Scoop small balls of dough (about the size of a well rounded tablespoon), roll into a ball, roll in sugar, and place in mini muffin tin. Bake for 8-10 minutes. Lemon poppyseed is one of my favorite breakfast flavors that I tend to forget about! Love these little muffins! These look delicious, and perfect for a Sunday morning! These are soooo cute, and I LOVE lemon pastries! They look awesome!! Oh yes, lemon poppy seed is such a classic and one of my absolute favorite flavors! Oh wow, these look so good. I love lemon poppy seed muffins. I bet these are just as good! 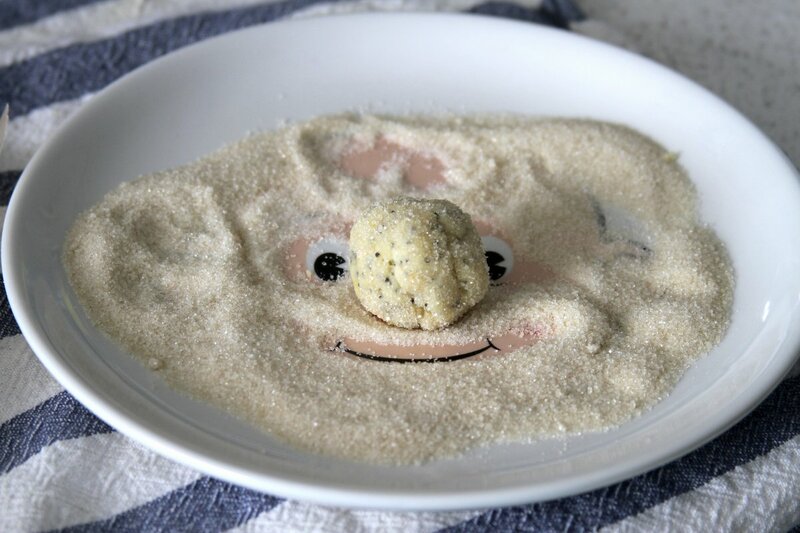 Such a cute face in the sugar! Yes, puh-lease. Truly, hot oil isn’t as scary as it sounds, but I’m all for baked treats! Oh I am *so* with you on baking v frying. Love the idea of these little bites of goodness! Lemon poppy seed and the Mindy Project…perfect weekend combo. You rock! I’m scared of boiling oil, too! I always avoid those recipes that require it. These look so good – I love this idea! PS – I am totally freaked out about cooking things in hot oil too. I can’t shake the thought of my kitchen going up in flames..
yum yum yum…….. so hungry because of your post! xO! 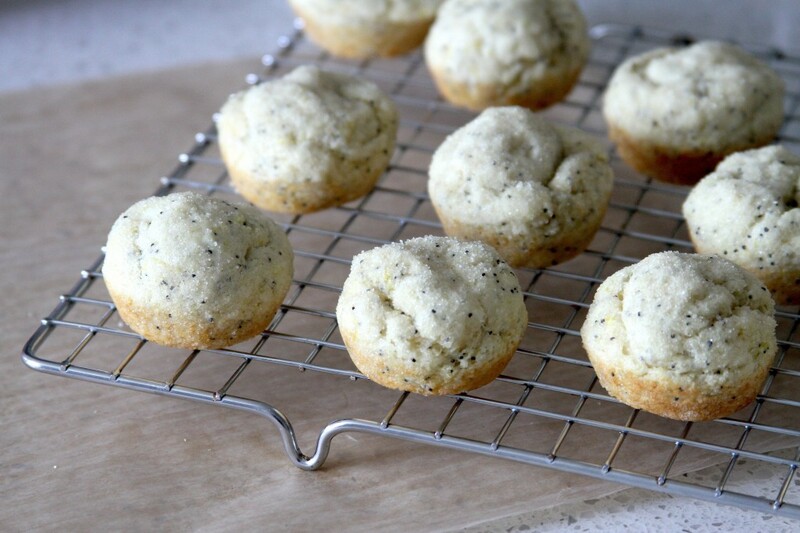 Oh…I love these sweet little bites…lemon and poppy seed is my absolute favorite! These are great, Ashley! Ooh, these sound SO tasty. You know I love lemon, so I’d be all over these! And I love the plate – ha! The muffin tin is an AWESOME idea! I am with you on the hot oil, it freaks me out. That’s why I love these doughnut bites! They would totally tempt me out of bed on a Sunday morning. These look so incredibly fun and pop-able! I’m terrified of frying, too, and I’ve been wanting to try so many baked donut recipes. I’ve just added this one to the list! Love these! So cute and that roll in sugar? Yummm. I’m scared of boiling oil too – I avoid it at all costs! I’m OBSESSED with lemon anything right now, and especially lemon poppyseed anything. 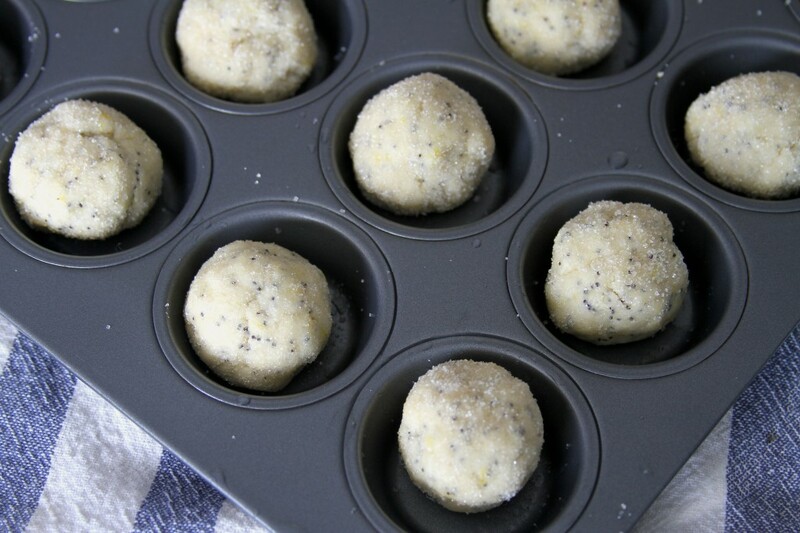 Love that you can make these in a mini muffin tin! And that plate is too adorable. Oh yes, I can totally kill the whole batch in one sitting, or maybe two! Looks so delicious. I love lemon and poppy seeds! 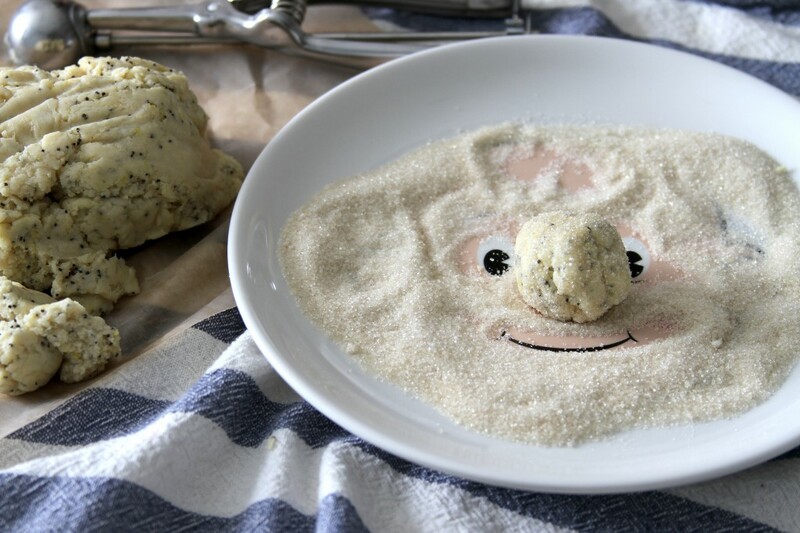 love that cute little face in the sugar. 🙂 I love lemon baked goods (esp with poppyseed) and these are adorable. Yeah, I’ve definitely been there…eating the whole batch of something. Whoops. Was totally worth it, though haha. These sound delicious, and I’m all for baking instead of frying. Freaks me out as well! Ooh, a baked doughnut recipe that doesn’t require a fancy doughnut tin! I am sold. I’m also terrified of deep-frying things. I can’t even sauté without burning myself. These are super adorable! I love doughnut bites! 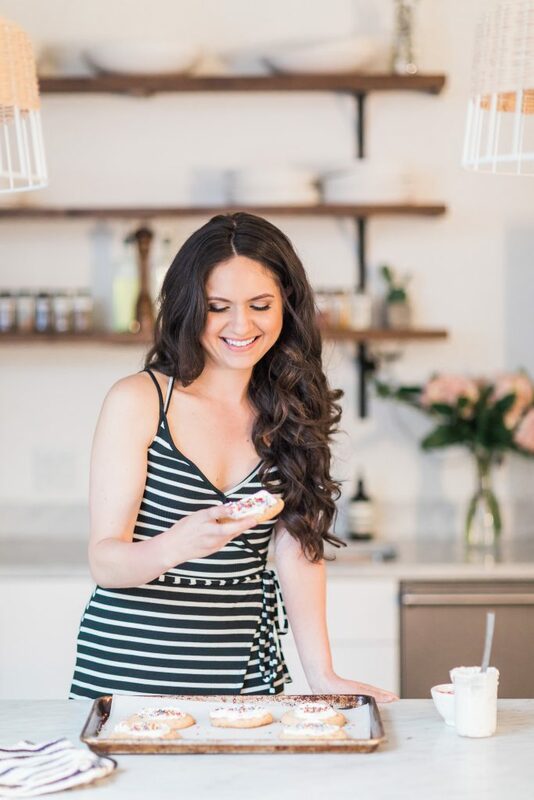 Also.. doughnut bites = YES. I’ve never made a muffin this way but I’m DYING to try it! Lemon poppyseed is favorite #2 for me (after blueberry of course). SO gorgeous! Love the lemon and poppyseed. The plate photos are cute! The plate! A face plate always brightens my day. These doughnuts do too!